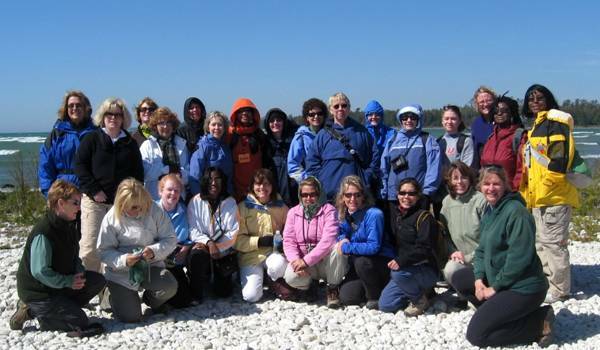 12:45 pm: Meet at Cave Point County Park, ready to hike. and you can venture onto its railed catwalk. Trailbound will cover your admission fee. 6-8 pm: Dine at Mission Grille, housed in a renovated church, complete with stained glass windows and pews. The food at this Sister Bay restaurant is as wonderful as its ambience. 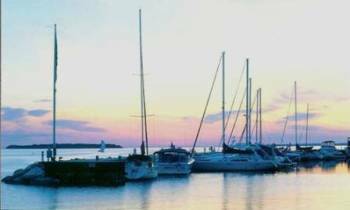 After dinner, join us to watch the sun set over the harbor at Bayside City Park Then, return to the hotel for an indoor swim, whirlpool, games, or other relaxation. 8:30 am: Meet for our days adventures. 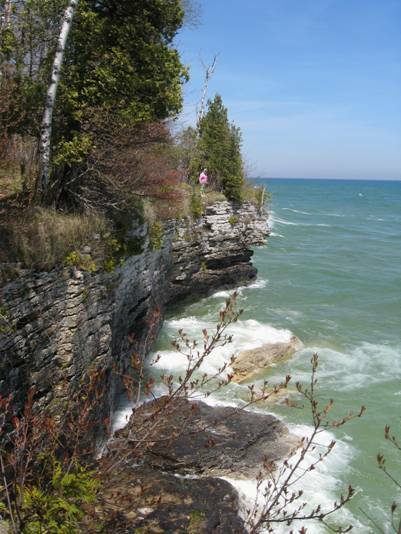 9-10 am: Hike at Ellison Bay Bluff County Park, a 174-acre hidden treasure. It offers one of the countys most outstanding lookouts from towering 100-foot limestone bluffs. 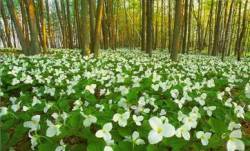 Our 1-mile hike also treats us to a magical array of woodland wildflowers. 10:30 am-noon: Explore Newport State Park on this 2-mile hike. Newports 2,400 acres boast 11 miles of Lake Michigan shoreline, evergreen and hardwood forests, upland meadows, and wetlands. Well eat our trail lunch along the parks beach. 12:304 pm: Enjoy free time for a guided 10-mile bike ride on a crushed-gravel trail through gorgeous Peninsula State Park. (Bring your own bike or rent one.) 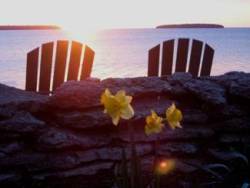 You can also use this free time to check out Door Countys great shops or relax at our hotel. Weekend hikers: Consider hiking with our guide at The Clearing, open to the public on Saturdays only. 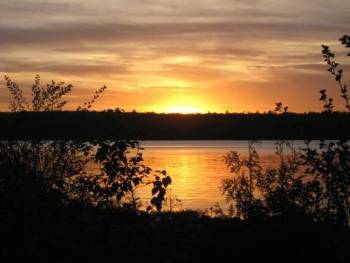 7:30 pm: Watch the sunset over Green Bay from our park shelter overlooking the bay. Enjoy the warmth of a campfire, toasty smores, and friends. 8:159:15 am: Savor breakfast and a yummy Swedish tradition at popular Al Johnsons  or opt to eat on your own. 9:45-11:30 am: Hike Eagle Cliffs at Peninsula State Park. This gorgeous 2-mile loop features some of Door Peninsulas most dramatic scenery: towering bluffs, cobblestone beaches, and sea caves. Enjoy time to sit along the bays peaceful waters, watch water birds, and unwind. 11:30 amNoon: Enjoy a trail lunch together at this lovely park or feel free to get an early start home. Noon: Head home, refreshed and relaxed. Youll love this inn! Enjoy its indoor heated pool and whirlpool, front porch rockers, fitness center, fireside great room, guest laundry, and WiFi. The 1-BR suite has one bath and 2 queen beds in one bedroom. In each 2-BR or 3-BR suite, youll have 2 baths and your own private bedroom with a king or queen bed and a TV/DVD. All suites have a spacious living room with a fireplace, TV/DVD, and sleeper-sofa; fully equipped kitchen; dining area; private deck or patio; and coffee maker, hair dryers, alarm clocks, shampoo/conditioner, and iron/board. Prices are based on up to 2 people in 1-BR & 2-BR suites and 3 people in 3-BR suites. Add $12/suite per extra person. Weve reserved the rooms; you can put the room under your credit card when you check in. 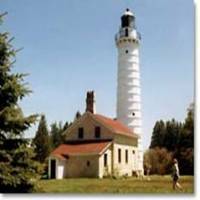 Cost is $235 per person, which covers two guides throughout the getaway, trip arrangements, lighthouse tour, detailed info packet, and the campfire. We do not "package" other trip costs because weve found you enjoy deciding your own room types and meals. Your trip = your choices.